IteoR People – Thousands live and die under the banner. It is a land of mystery, of frigid temperature, and constant battle where the Flame of the North, King Jarek, holds sway. It is a land of pale beauty, and fiery rage. It is a land where those who live, serve with undying fanaticism to the Lord of the North. IteoR’s rise to glory was a quick, decisive, and brutal affair. Hardened army, unequalled commanders, and the will to dominate all who stand in their path mark the Legions of IteoR as the most battle-tested and strong force of soldiers in Finaru, possibly the world. Their quick and merciless ending of Dymises was not precipitated in any way by the casual means of normal war. With far reaching screens of Drow their dwarven-made armor and elven steel quickly marked it’s dominance over the weakling forces of their enemy. Upon taking the city, they cast down the temple to the Dark Ones, burning the priests and all those who sought to stave off the Flame of the North alive. Casting down the relics of a past that no longer held any bearing the Legions, under the direction of both famed swordsman Jujenjitsu, and battle-tested leader Gian, crushed the bloodlines that held sway, leaving none to inherit the nonexistent Dymises. With the help of the Drow B’esctra, the Painter of Souls and the Dark Shadow of King Jarek, the forces of IteoR proved to the world their indomitable fury. Spurred forth, the great construction of their city neared completion. Upon being done, it spiralled to the heavens, a dizzying array of the most potent architecture. Great, thick walls loom over the hilly plains of Northern Finaru, showing black stone of large cut. Much more densely populated than most of the regions to the North, the average IteoRian is used to surviving in conditions unbearable to most. Venuso alone boasts harsher climate, and yet IteoR has the extremes of both; sweltering heat in the summer and the icy fist of winter. With much of the world threatened IteoR had mad many enemies. Yet the strength of its Legions was unparalleled. And upon the field of battle their thickly armored bodies moved easily in and out of enemy formations, always maintaining discipline. Not few were the Dwarves who believed the Legionaries, averaging six and a half feet of height and easily as broad to match, were truly overgrown Dwarves at heart. Thick axes and hammers, swords and lances herald their coming. The devastating blast of fire from the King waxing through the long days of battle ahead and behind them. With the inclusion of a visitor from a far away place, Zhou Yu, their armies grew even more disciplined, and hardier. Dayne, the elven warrior-mage, added an element of experienced held by so few in the IteoR ranks, proving his loyalty and worth many times over. 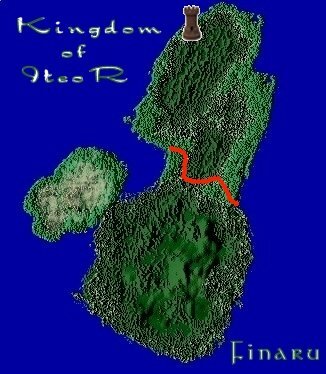 Extending from the very tip of Finaru, from coast to coast, and descending all the way to the isthmus that connects North to South, IteoR reigns supreme in the largest area known to any modern Kingdom. Thousands live and die under the banner, all are cremated by fire. Long live the Flame of the North. Sing praises and despair, for the growing heat of IteoR knows no bounds. In the eyes of Rapture they behold all.